After the 2008 demise of the Gulf Coast melodic rock outfit Biloxi, guitarist Mark Lanoue held together the lineup from the band's last performance and launched the Chasing Karma project. Similar in style to Biloxi, Chasing Karma is about sharp hooks, intricate harmony, and an optimistic attitude. Cosmocracy is the band's debut effort and, though the production is a bit thin at times, is an enjoyable listen for melodic rock fans who don't mind a shot or two of heaviness. The guitars drive Chasing Karma's sound, which is expected given the fact that the band boasts three six-stringers. An interesting gimmick, for sure, but the reality is that you wouldn't know it just by listening. Lanoue, James Gillies, and Dave Melton manage to keep out of each other's way while still delivering nicely varied yet similarly-styled riffs and leads. Occasionally a bit of flair creeps in, such as the proggy solo on album opener "Destiny" or the extensive soloing on "Your Fallen", but by and large the riffs are held in check by a good sense of AOR melody. Lanoue, Gillies and Melton also add some contemporary accents at times, with a bit of an early Godsmack sound on "Destiny" and a slight Alice In Chains grunginess on the bass-heavy "What A Shame". "Fight For Me", one of the album's heaviest tracks, wraps up with a shredtastic performance of "America, The Beautiful" and - in true Hendrix style - a few notes from "The Star-Spangled Banner". Lanoue also provides the voice for Cosmocracy's positive-outlook lyrics, and he does so with convincing emotion. 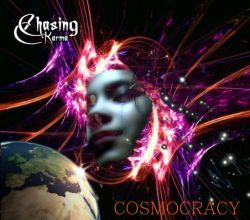 His delivery is well-suited to Chasing Karma's sound, especially so during the refrains when he's joined by the rest of the band to create some of the album's more infectious moments. Lanoue has stated in the press that he deliberately avoided altering the band's vocal sound during production so that they'd capture the same dynamic that fans would hear when seeing the band play live, and Cosmocracy definitely has an "in concert" quality to it. Melodic rock and AOR fans will want to investigate Cosmocracy further, as it has plenty of crunch and a number of power ballads to please a wide range of listeners. There's a hint of thinly-veiled evangelicalism, but the contemporary touches, such as the Weezer-like "Don't You Think", add some unexpected variety and enhance the album's appeal.